Share the post "Top Field Service Books for Service Managers and Business Owners"
Books are not lost! Here are some of the top field service books to help you refine your service business strategy, provide remarkable service, and remind your team how awesome the skilled trades can be. Reading reputable industry books is a great way to supplement your research and learn new business tactics. Here are the top field service books that, through their research and personal anecdotes, can help us learn about the landscape of field service today and what it looks like to run a successful service business. With more field service companies investing in mobile technology to manage their service operations, businesses need to reimagine how they serve and engage with their customers. B4B is a great place to start. It outlines the shift from selling things to customers to delivering outcomes for customers. In a B4B model, companies and customers are more like business partners. B4B is a fascinating idea for businesses today and the book’s an interesting read. Check it out! If you’re looking for a book specifically geared toward the field service industry and addresses its specific problems and challenges, 42 Rules for Superior Field Service is the book for you. Rosemary Coates and Jim Reiley offer insights based on real world experience with a combined 50+ years of involvement in the field. The books is practical and to the point (no time for fluff!) and lays out recommendations and examples to help businesses develop a field service strategy, organize the service business, optimize field inventories, implement CRM, and tailor sales incentives. Check out Coates and Reiley’s book if you’re new to the field service industry, looking to makeover your operations, or are searching for a key to make your service business more profitable. Stephanie Chandler’s 2012 book, Own Your Niche, is perfect for field service organizations looking to get more engaged on the web. She offers a great way for service organizations to do business because the sales and marketing tactics she recommends are based on just that: service. The book includes step-by-step strategies for taking advantage of your website and populating it with quality content. In addition, Chandler includes interviews with successful service-based business owners who reveal how they built authority in their industry and created successful service-based businesses. It’s not all about field service and related industries, so you’ll need to discern which points are relevant to you, but if you’re able to focus on your business and your industry, Chandler’s advice can help service businesses in any industry take next steps to leverage internet marketing and provide useful resources and service to their customers. This David Meerman Scott book is hot off the press. Published September 2, 2014, The New Rules of Sales and Service, posits that service companies need to get with the times and move away from traditional sales and service models. Meerman Scott explores how businesses can navigate the new digital landscape to improve business practices and leverage useful content through social media as a sales strategy. The New Rules of Sales and Service is more about how companies can market and sell their products and services than how to actually execute service, but it offers useful advice as organizations adapt with the growing trends in social engagement, providing customer-centric service, and leveraging the Web as a tool to facilitate the buying process through content. We all know Mike Rowe as the popular media personality and host of Discovery Channel show Dirty Jobs. But did you know he’s also a writer? In his book, Profoundly Disconnected: A True Confession of Mike Rowe, he challenges the belief that a four-year degree is the only path to success and glorifies skilled trade careers as fulfilling, lucrative, and much needed alternative. With many service organizations in need of skilled service technicians, Rowe’s book is a fitting call for more young people to enter into service and repair work and give the field a new image. While Profoundly Disconnected won’t teach you how to run your business, it’s a good morale booster for the skilled trades and a good read for anyone on the fence about entering the profession. If you like Dirty Jobs, you’ll like Rowe’s book. 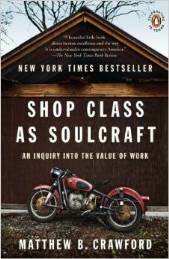 Like Mike Rowe’s book, Matthew Crawford glorifies the skilled trades and manual work in Shop Class as Soulcraft. Crawford, who has a PhD and works in academia at the University of Virginia, offers a different perspective than Rowe. They both argue, however, that there shouldn’t be a separation between thinking and doing. Crawford uses his own experience as an electrician and mechanic to present a case for self-reliance and the benefits cultivating the concrete skills technicians would need to be successful. The book suggests there is honor and fulfillment in fixing something that isn’t working. While a bit philosophical for day-to-day field service business management, this would be a great book to share with your techs to show you respect and value their work. Have a favorite book that’s helped you manage your field service company or changed your mindset in a positive way? We’d love to hear about it. Running a service organization is hard work. You need to be constantly educating yourself about best-practices and how you can help you service company succeed. Use this complimentary content offer to choose the right field service app for your company. Subscribe to our Field Service Management Blog for weekly content updates. This entry was posted in Field Service, Field Service Technician, News, Service Manager by Joanna Rotter. Bookmark the permalink.